What happens if I miss a class because my baby is poorly or I’m on holiday? When you book for a half or full term this keeps your space in the class (most classes are full or have waiting lists). You are welcome to swap to a class on a different day during the week if there is a space. Ask Rachel in class or via email if you have any further questions about this. We speak two or three languages at home. Will signing help with this or delay speech? Signing with your baby/toddler will definitely help with language development for two or more spoken languages. You can use the visual sign to connect the words used in each language so that your child really makes the connection with the meaning of the word and it will help with clarifying what is the same in both languages. We have lots of parents attending classes with two or more spoken languages at home and have received very positive feedback. Look at the testimonials section of the website for some of their stories. (Languages other than English or British Sign Language that parents have spoken at home have included – Telugu, Hindi, Punjabi, Croatian, Checz, Greek, French, Spanish, Hebrew, Japanese, Italian, Sweedish and Malayalam). Is my baby too young for classes? No! Classes are suitable for babies from birth. 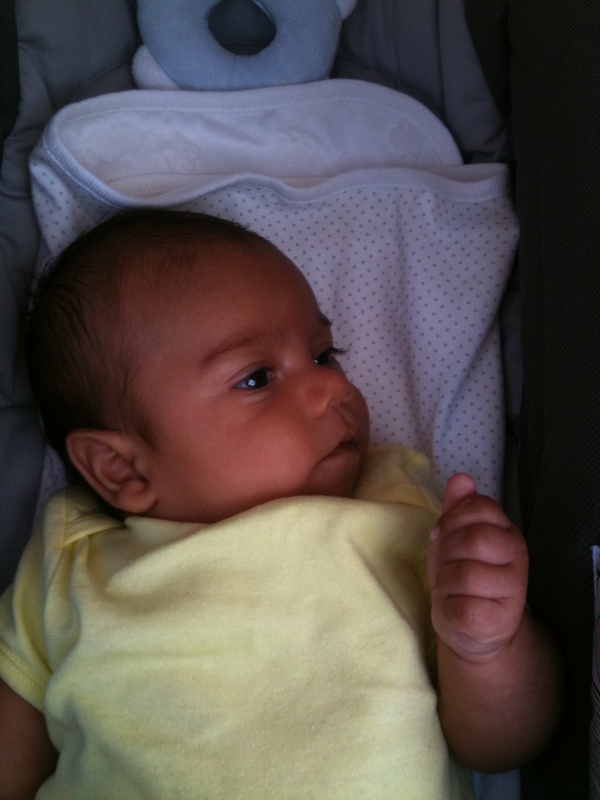 Jai is pictured below signing ‘milk’ at 6 weeks old and he first came to class when he was 2 weeks old. Babies regularly come to class from around 6 weeks old and the earlier you sign with your baby the earlier you are likely to be able to communicate with them and understand what they want. Is my child too old for classes? Classes are currently for children aged up to 5 but older siblings are welcome to come with advance notice. This usually happens during school holidays and weekend events. If your child is older but wants to sign and likes singing then watch this space as Signs and Sounds is hoping to launch a signing choir in summer 2016. Can I bring my partner/mum/dad/friend etc to classes? Yes. The more family and friends that are aware of the benefits of signing with your little one the better. I often find that children who have more that one person coming with them tend to learn how to communicate using sign language much more quickly. Can I feed my baby at the class? Yes. You can breastfeed, bottle feed and give your little one food before, during and after the class. There is always water available at the front of the room for breastfeeding mums. What are the refreshments at the end of class? Tea, coffee, decaf alternatives, a variety of herb teas, squash and water are all available to drink. There is also cows milk and plant milks such as soya or coconut. Biscuits and raisins are also provided. All biscuits are dairy free and vegan and gluten free can be provided on request. Can I bring my pushchair to the venue? Yes. As you come into the side entrance of the Christadelphian Hall there is a hall way with space to leave pushchairs to give us plenty of room in the main hall. If your little one is asleep in their pushchair you are welcome to bring them into the hall. Why do you use music and free play with instruments in a signing class? There is a direct link with music and language development. Discovering instruments, tempo, pauses in music, playing loudly and quietly all help with learning the rhythms and turn taking of language. There’s a great article here which gives information on a study of nine-month-old infants that regularly attended musical classes and shows how it improved the children’s ability to process speech sounds as well as musical rhythms. What is the music that you use in your classes? I use music from a variety of genres and cultures. some of the main CD’s I use and can highly recommend for babies and toddlers are listed below.